When I offer hospitality, something amazing happens—so much more than I have anything to do with. An exchange takes place. Our guests bring who they are with them and enlarge our lives in their offerings. When we offer guests space, a lot of creative growth occurs. Eugene and I don’t “entertain,” as such. We might go hiking, take a walk with our guests, or take a swim with them, but we don’t “show them a great time,” so to speak. What I do before they arrive is the usual—prepare beds and get a little dust off of things, plan and shop for meals, maybe place a few wild flowers in their room, some extra little touches to show we care about them. But we basically leave them alone while they’re here. We always have good, rich conversations around the table at mealtime. Giving people space and a listening ear and heart are often rare in today’s world. And people are hungry for it, whether they’re aware of it or not. St. Paul reminds us, “Be inventive in hospitality.” The sky’s the limit. There are various ways we can extend hospitality in our world today. Smiling at people you pass in the store or on the street. A simple act, but sometimes it makes a big difference to someone who is not feeling very well that day. Holding the door open at the post office for someone coming in, greeting people you may or may not know. These simple acts of kindness done in the spirit of Jesus can and do make a difference. 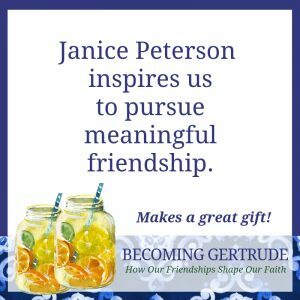 When I was in high school, Gertrude gave me a little book entitled Try Giving Yourself Away. I’m sure it’s no longer in print and I don’t have my copy after all these years, but what I remember is that it was full of stories of people who were encouragers to others. 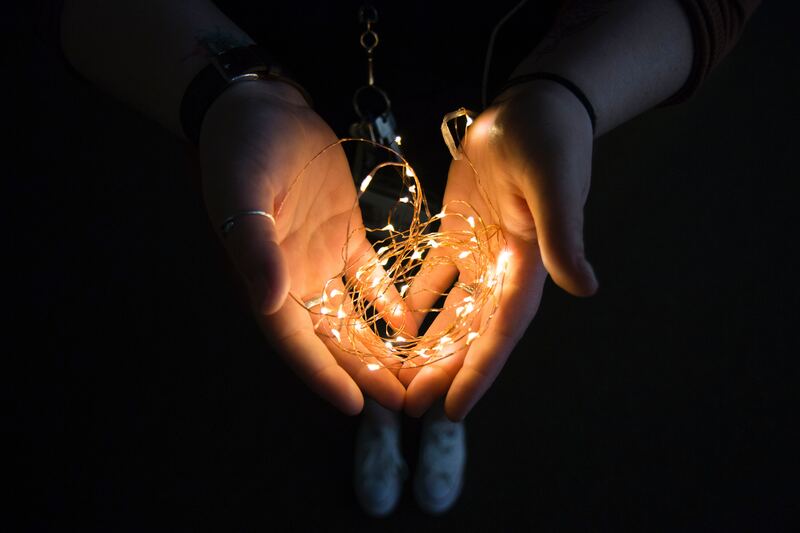 Like writing to an author and thanking him or her for their writing, or telling someone else what they see in the other person that stands out, or writing notes and letters to friends who are going through a hard time in their lives. The idea of trying to give myself away has stuck through the years as a particularly effective form of hospitality. I remember my friend Lu doing that with the visitors to our church, asking them questions about themselves, showing an interest in them. After observing her, I made a concerted effort to start doing that myself. I guess what you might say is I got out of myself, my self-centeredness, or I stepped aside enough to provide space for the other person. Giving yourself away doesn’t have to be a big thing—just an intentional one, an action that shows love and awareness of the other person. I’m reminded of the year our son and family treated Eugene and me to an afternoon performance of The Sound of Music for Christmas. During the intermission, our ten-year-old granddaughter Mary asked her grandfather what he wanted for Christmas. He said, “Silence!” She looked at him kind of funny, then turned to her father and said, “Grampa wants silence for Christmas.” They chuckled, and nothing more was said. Two weeks later, when our son brought down their dog for us to tend to while they went to Ohio for Christmas, Leif handed Eugene a large box and said, “This is from Mary.” Eugene opened it up and inside found a piece of paper folded in fourths. He unfolded the paper and it had been colored on both sides of the paper with a yellow crayon. On it, Mary had written “Merry Christmas, Granddad, and a Happy New Year. Silence is golden or yellow.” Then, at the bottom of the paper—“HA-HA-HA.” In a small, perhaps silly way, Mary was learning to give herself away—remembering what her grandfather wanted and finding a creative way to give it to him. So you see, I’m simply suggesting using our imaginations and being creative in our giving. You’ll be surprised at how much a person will be touched by something unexpected coming their way and what a lift it will give them. But you will get a lift as well. It’s really fun. Sometimes if you try and give an old grouch a gift of imagination, it may backfire on you, but sometimes, that touches them in the deepest places of their hearts. They’re surprised that someone is thinking about them and caring for them. But we cannot show true hospitality if it’s not in every aspect of our life. Have you thought about what it means to be hospitable to your family? That seems strange to ask, doesn’t it? But we perhaps need to think about that, for it is here, in our families, that hospitality makes the most difference to our world. In our families, we are not only learning to show hospitality on a daily basis but also passing it on in a consistent and faithful way. Hospitality in our families can be as simple as preparing an evening meal and having the whole family sit around the table, sharing in the food and in each others’ company. Albert Borgmann, who works out of the philosophy department at the University of Montana, talks about focal practices, which he defines as something of ultimate importance that counters the modern distractions of technology. [i] The Latin word foci, from which the word focal comes, means “hearth.” The hearth is a focal practice. Before we had furnaces in our homes where all you have to do is turn on a switch, you had to gather wood, cut it, split it, bring it in to the fireplace or the woodstove, cook over it, keep it stoked during the day, and when it got dark at night, you put more wood on the fire and went to bed. The whole family was involved in the focal practice of the hearth. Another focal practice that many have again picked up in their families is the vegetable garden. I used to have our kids help after the harvest by making pickles with me, getting the tomatoes picked and ready for Eugene and me to make tomato juice and canned tomatoes for the winter. I never knew I was doing something called “focal practice” at the time, but we sure had a lot of fun doing it together as a family. Many of the focal practices are a thing of the past, and if we let the evening meal go, we are letting one more focal practice disappear. The evening meal is where we can be hospitable to each other—asking about each other’s day, talking about people we saw and conversations we had, sharing about things we learned at school. When my fifteen-year-old grandson heard me bemoaning the fact that so few families have an evening meal together and how that must be having a ripple effect on our brokenness, he said, “That’s the only time when we see each other all together each day.” He felt that it was really important. Around the same time, I heard that the one thing all the most recent National Merit Scholars had in common was the evening meal. Does that sound as though something significant might go on in those homes around those evening dinnertimes? When we show hospitality to our family, we are developing the practice to give beyond ourselves—and we are modeling hospitality to those who are watching us most closely and see us every day. I’ve discovered that when you make a decision to show hospitality and start acting on that decision, the first step is a huge one. It leads to other acts of kindness and more and more creative acts. As we practice, something gets freed up inside us, and hospitality becomes more and more natural in our day-to-day living. St. Paul’s treatise on freedom from the epistle to the Galatians reads like this in THE MESSAGE: “It is absolutely clear that God has called you to a free life. Just make sure that you don’t use this freedom as an excuse to do whatever you want to do and destroy your freedom. Rather, use your freedom to serve one another in love; that’s how freedom grows. For everything we know about God’s Word is summed up in a single sentence: Love others as you love yourself. That’s an act of true freedom” (Galatians 5:13-14). True hospitality should emerge out of that beautiful freedom. [i] Albert Borgmann, Technology and the Character of Contemporary Life: A Philosophical Inquiry (Chicago: University of Chicago Press, 1984), 4. In the NT hospitality was a built in part of every gathering. Believers met in homes and shared meals together. Ever since church life has abandoned this practice to pulpit and pew buildings, hospitality has become very rare. There is no command to meet in homes and to not in pulpit and pew buildings. But this is not required when we give the obedience to the command to hospitality it’s valid weight in our practice. When we abandon even one repeated instruction and put an alternative practice in it’s place, many corruptions will be included, and then we will still call it all godly. It’s actually sinful. 99% of God’s people have their hearts and minds chained to the notion that their church life MUST take place in a pulpit and pew building, in spite of my pointing out this regular systematized disobedience for meeting there. Many truths become meaningless when we disobey even one very clear instruction. Can you interact about this?